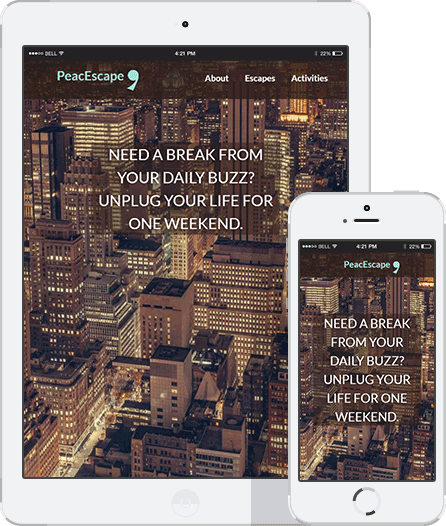 PeacEscape is an email travel service that focuses on quiet retreat weekends. 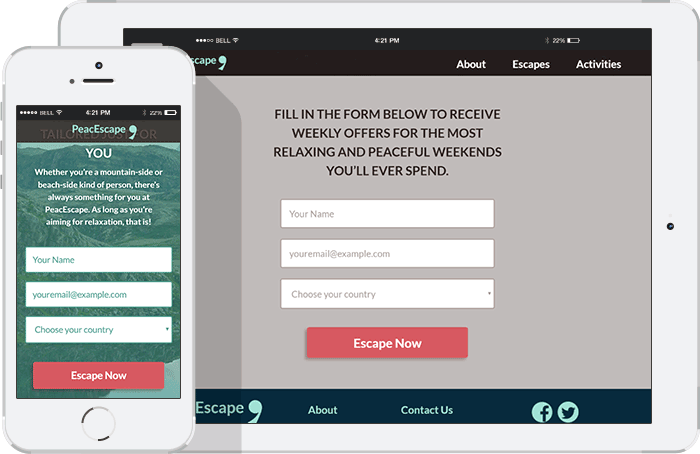 Their goal is to email their users weekend offers with booking options. The service is specifically aimed at women between 25 and 35 years old who are working in a demanding job. The website is custom designed and custom coded. It’s build with the Headway framework in WordPress. PeacEscape’s website is designed to grow the business through gaining more email subscribers. Therefore, the single purpose of the homepage is to invite users to sign up to the service. The layout of the page is designed to guide users to the call to action, in this case the sign up form. The overall design direction mirrors the emotional state that the ideal client of PeacEscape finds herself in. It creates a story where the user starts stressed out by her job then the design is gradually taking her from stress to relaxation. The photography used in the design illustrate the unique selling proposition of PeacEscape. It also helps further convey the idea of emotions to the user. The logo and color scheme were chosen with the ideal client in mind. They are appealing to younger women while maintaining the idea of peace and calm. The website adapts to any screen size to make sure users have a smooth and consistent browsing experience no matter which type of device they are using.